This low-volyage transformer is for LED lighting. Includes four-way splitter to allow connection of up to four lights. 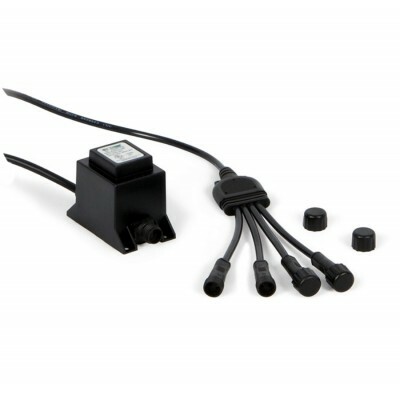 Connects to standard household current and provides transformed power for the SOL™ and AWG™ LED spot lights and landscape lighting. Use with the SOLW2, SOLW6 and the SOLWLR light ring. Can also be used with the AWGLED1, AWGLEDLG and the AWGLED3 pond lights. Model: SOL30X4 from Atlantic Water Gardens. This is the updated version of the SOL20X4 model which is the previous version. This new version has a 30 watt capacity. Optional 20' extensions are available, model SOLWEXT.